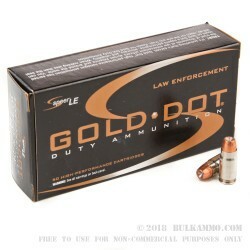 This bulk case of .357 Sig Sauer Gold Dot ammo features 1000 self-defense rounds with unbeatable terminal performance. 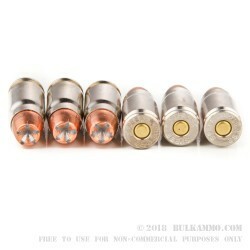 Equipped with 125gr Gold Dot hollow points, these .357 Sig rounds hit hard and fast with a muzzle velocity of 1350 fps and a corresponding energy transfer of 506 fps. Gold Dot projectiles are valued because of their terminal effectiveness due to the expansion and weight retention resulting from the Uni-Core bonding process that fuses the copper jacket and lead core of the projectiles. Speer’s method of chemical bonding sets their bullets apart from the competition and helps create bullets that can pass through barriers without losing the energy transfer required to ground a threat. Because Speer uses only the best components such as nickel-plated brass casings, these .357 Sig cartridges perform almost flawlessly in the chamber. The smoothness of the material promotes reliable feeding and ejecting, and the casings are super resistant to corrosion, adding a long shelf life to these premium self-protection rounds. 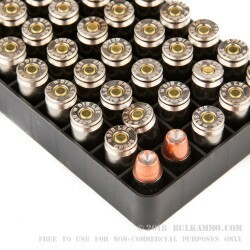 You can squeeze extra value out of these cartridges by reloading the Boxer-primed casings. 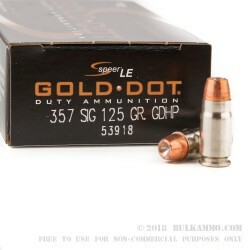 Speer Gold Dot ammo is the perfect choice for in-home defense or CCW. Order your 1000-round bulk case today!